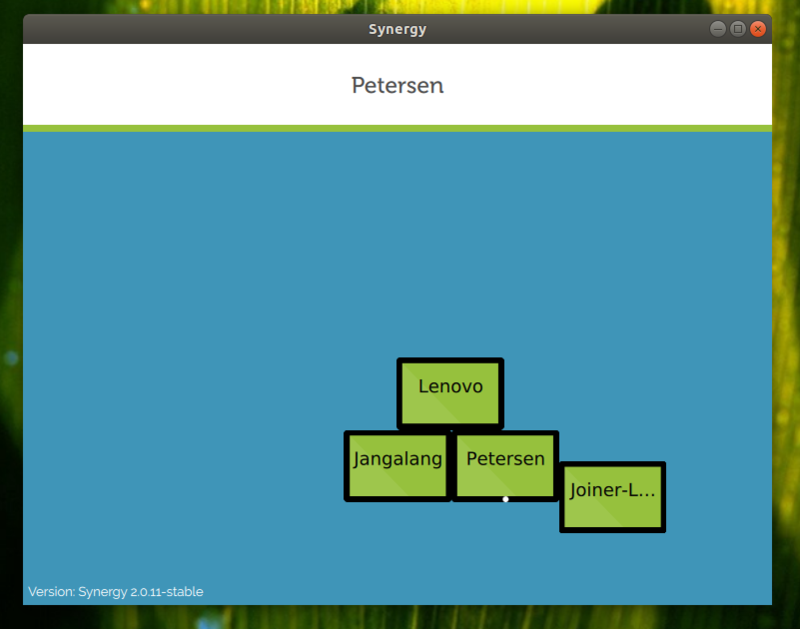 I'm using Synergy to allow me seamless access across a variety of machines on my desktop. I accept that this may be an extreme case, but there are a couple of things that are driving me nuts. * A macbook to the right of this (call this Mac). I can live with this. The thing that drives me NUTS is what happens when the mouse pointer transitions between [W-1,W-2,W-3] and NUC. Synergy scales the whole top edge of [W-1,W-2,W-3] to match the bottom edge of NUC. When moving the mouse pointer upwards, this is fine, cos moving it out of the top of any screen moves it onto NUC. When moving down, however, if I move it out of the left hand bottom of NUC, rather than appearing on Win-2 as I'd like, it appears on the left of Win-1. This causes me to lose track of where the pointer has gone *EVERY* *SINGLE* *TIME*. Now, I appreciate that maybe I just need to retrain myself, but it would be REALLY nice if synergy could actually show all the different monitors on a single machine in the config window (or to at least show them scaled according to the resolutions they use), and allow stuff to be configured properly. Anyone else being bugged by this kind of thing? Is there a chance this is a result of Windows scaling in New version? No. All my monitors are configured to be at 100%. I believe it's purely that my windows desktop has a 5760 wide display surface, and the NUC has a 1920 wide one. I Have a similar issue where I have 3 monitors on the bottom and two monitors above, but separated and Synergy is very inconsistent about where the mouse can and cannot transition between the monitors. From the outside two lower monitors, I can't move to the top monitors, I have to move to the centre monitor first and move up to the top monitors. Coming down, the mouse basically does what I would like, coming straight down to the monitor below it, but it's not always consistent. I think this is cause by Synergy not having any concept of multiple monitors and it treats these as a single large display. If the resolutions and numbers of screens attached to each system were identical it would probably work fine. But where there are differences or monitors are offset from each other, it gets confusing. I think that there is a Feature request for adding support for positioning of Multiple monitors and hopefully such a feature would also take into account varying resolutions between monitors. But until that feature comes along, I think we're stuck with making do. I'm not sure I'm conceptualizing your set-up or how you would rather transition. Back in Version 1, we could set a keyboard combo that would switch to a screen directly. I've seen discussion of that being a feature of 2.1 but that's off on the horizon.